Ford Transit Transit ABS pump is a one elements of category brake system for Ford Transit. Ford Transit Transit ABS pump is a one elements of category brake system for Ford Transit. 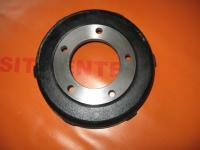 What is more to this section also include the brake pads and the brake disc. For many fans of this popular kind of van, the sixth generation was another breakthrough. It had brought numerous modifications of the body as well as technical issues. Heavily modernized car has waited a modern design, which has been continuing to this day. It is worth to mention that, in 2001 Ford Transit had earned a prestige title ‘Van of the Year’, and this emphasis a extraordinary contribution in the field of commercial vehicles for the businesses and the individuals. Admittedly, this is a fairly new construction, but as every used car – practically from the morning to the evening in very difficult conditions, those are necessary the periodic surveys and servicing (essentially in the brake system). Our shop will provide you finding the basic components, like the pumps and the brake pads, but also the minor elements such as the seals or the break cables. We try to make our offer constantly full, but if something is missing – we induce to contact with us by e-mail: info@transitcenter.co.uk.